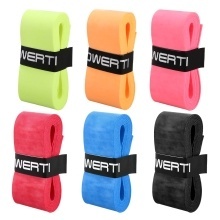 This pack includes 6pcs overgrips in different colors. These overgrips can absorb the sweat and reduce shock when you&apos;re playing tennis, badminton or squash, must-have for your racket. 6pcs overgrips with mixed colors: Black, Blue, Orange, Pink, Red, Yellow. Polyurethane construction with super-thin, high-stretch surface. Enhance sweat absorption, great anti-slip effect. Each overgrip measures 43.3 x 1.0 x 0.03 inches. Suitable for tennis/badminton/squash racket, fishing rod, bike handlebar, etc.